The GreenHomeNYC November Forum held at the Hafele America showroom showcased a panel of four thought-leaders, who provided insight on the current status of New York City’s mobility and addressed innovative solutions to create a truly Smart City. The panelists discussed exciting projects and cutting edge technology that will help cities cut their dependence on fuel inefficient cars. Jonathan Gouveia, Senior Vice President of New York City Economic Development Corporation (NYCEDC), spoke about the Brooklyn Queens Connector (BQX). The BQX is a project which would create a 16-mile waterfront streetcar from Sunset Park in Brooklyn, to Astoria in Queens, and would be able to accommodate 150 people. Evidenced by the NYC subway map, there is a lack of N-S connections from Brooklyn to Queens. The BQX can be instrumental in the effort to move people more efficiently, while improving streetscapes, currently dominated by one-person occupied cars. This would be the first large rail transit capital project in over 60 years overseen by the city. With that magnitude, many factors must be considered including route planning, street design approach, and system accessibility features, among others. Historically, Brooklyn was built via streetcars by creating an urban form. Taking a leaf from history and elevating it with today’s sustainability standards, the BQX is an innovative solution that would provide transportation while reducing the city’s carbon footprint. 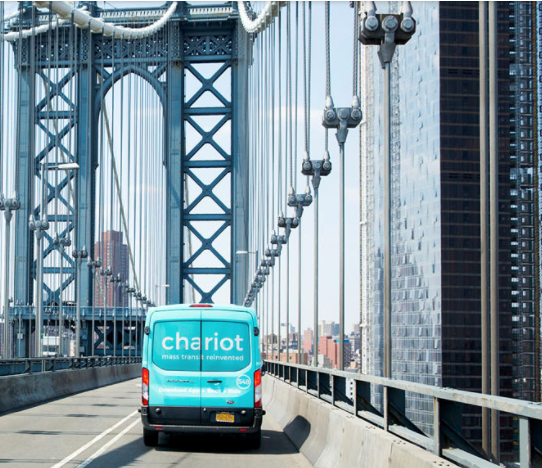 Chariot New York is a microtransit app that began in San Francisco and arrived in New York in August 2017. Saad Shaikh, General Manager, explained how Chariot relieves congestion and reduces vehicles on the road while offering a comfortable, personalized experience for the customer. The Chariot app allows commuters to book a ride in their transit vans along Chariot commuter routes, designed to fill gaps in the existing New York City transit options. 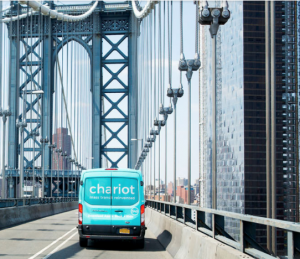 Using data analytics, Chariot developed four NYC routes, which tackle transit deserts. The term “transit desert” refers to residential areas where easy access to public transportation is not available. For example, 90% of people in Manhattan residential areas have access to a subway within a half-mile walking distance, where as only 54% of Queens residents have that same level of access. A KPMG study found that for each Chariot transit van in use on the road, up to 25 vehicles could be eliminated during peak demand. Each ride costs $4, carries up to 14 people in a van, and is equipped with Wi-Fi. All a customer needs to do is download the app, search for routes, check-in, and board. In September 2016, Chariot was acquired by Ford as part of the Ford Smart Mobility program. As a result, Chariot has the advantages of being vertically integrated with Ford and is also crowd-based, which allows new transit routes to be launched quickly based on public feedback. Shaikh proudly announced the recent launch of Chariot’s fourth NYC route called “Midtown Get Around” with 46 backers, each funding $13 (with this money going towards their future rides). Chariot sees a growing demand for their app in NYC and is currently working with municipalities, such as in Staten Island, to improve transit. Keith Todd Kerman, Deputy Commissioner at the Department of Citywide Administrative Services (DCAS), spoke about NYC’s fleet and inspired a positive outlook for the City’s transportation goals. Boasting the largest municipal fleet in the world, composed of 30,000 vehicles, NYC has spent $1 billion in fleet operations and procurement in the last fiscal year alone. In October 2015, Mayor de Blasio announced the initiative NYC Clean Fleet, which will grow the City’s electric fleet to at least 2,000 on-road electric vehicles and help cut the city’s greenhouse gas emissions in half by 2025. Currently, the city owns 1,000 electric vehicles and hopes to have between 1,500 and 1,700 electric vehicles by June 2018. NYC sought to match the City equivalent of Federal Corporate Fuel Economy Standards (CAFÉ, NYC Local Law 38 of 2005) with the goal of operating a fleet of vehicles meeting federal fuel economy standards of at least 54.5 miles per gallon (mpg). NYC achieved these standards by 2016, and by 2017, will have a fleet with fuel efficiencies of 83.7 mpg. Other initiatives in the NYC Clean Fleet effort are expanding biodiesel and renewable diesel use, right-sizing vehicles, and enforcing anti-idling for trucks. Kerman highlighted that the electric car fleet began with only one model, the Toyota Prius. Now the City owns 35 different models of alternative vehicles. The City is working with the Department of Energy (DOE) so that mechanics and high school students are trained using electric cars with solar charge. NYC serves as a lab for other cities and, if its sustainable transport measures can perform efficiently, sets the stage for other cities to follow. Lastly, Amina Hassen, an Urban Planner from WXY Architecture + Urban Design, defined electric vehicles (EV) as low-hanging fruit to achieve carbon reduction because no behavior change is required on the part of consumers. EVs make up 1.3% of total miles traveled, and decreased price points, rebates, and better infrastructure have contributed in making them a viable option for more consumers. WXY uses policy, strategic planning, design, and programs to promote EVs and develop New York’s EV and EV charging station installations. WXY’s Green Loading Zones create a policy solution to incentivize the use of electric trucks through the creation of curbside loading zones that are exclusively available to zero-emission commercial vehicles. Their Residential Carshare study is investigating the feasibility of resident-exclusive car share programs using EVs at low- and medium-income residences in Westchester County. 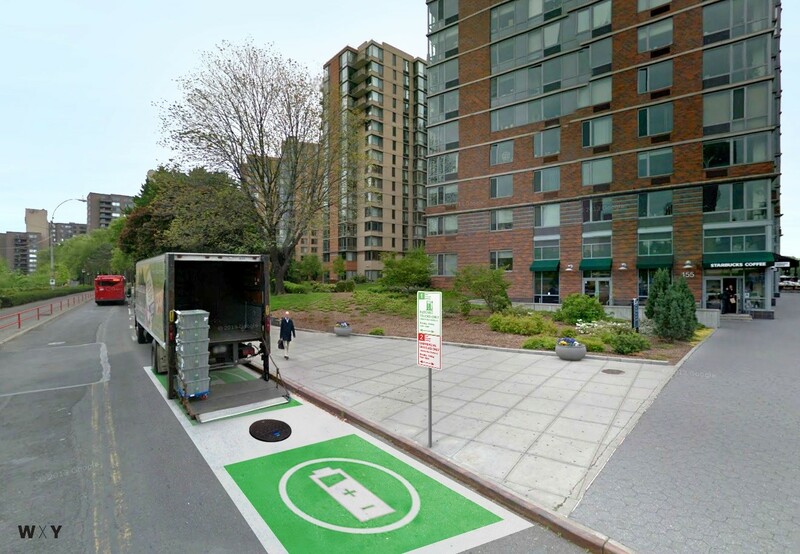 WXY is conducting NYC’s first curbside charging study, which identifies neighborhood topologies suitable for charging station installation and develops a methodology for identifying suitable sites. Hassen pointed out that regional planning for EV infrastructure is crucial to build an adequate EV ecosystem that helps drivers overcome range anxiety. Municipal-level decision makers, including board members, planners, and local officials play an important role in creating EV-ready communities that support the EV ecosystem. Through examples in the public and private sectors, the City is addressing the challenges in mobility and transportation with advancements in technology to provide innovative solutions that are more efficient and sustainable.